This is a request from a friend from Dubai-days who just posted on my facebook page. I am now posting my carrot cake that she dearly remembers and wants to recreate herself. I used to give cooking demonstrations in Dubai for 6 years and at the same time prepared cakes for some of these fun people who loved to party! Eventually before I left Dubai I do remember giving a series of baking classes to some of these very enthusiastic social ladies. If any of you are reading this page at any time please leave me a comment. I would love to connect with you all once again. It is so heartwarming to be remembered with such warmth after almost two decades. Thank you for the kind words Jeroo. Enjoy it! This carrot cake is a light fruity nutty tea-cake. Or a rectangle 13 x 9 x 2 pan; Bake this at 300F/160C degrees for 65 minutes. Two 8 inch round pans were used for the picture above. Baking it for 50 minutes. Lower the speed and spoon in or fold by hand into the egg mixture. Pour in the prepared pan and bake. Test the cake with a skewer to ensure it is cooked through. Do not over bake it as it will get dry. If the pans are the perfect size and the oven is preheated it will be ready on time. Overturn on a platter. Cool and Frost. 2 cups icing sugar or until the frosting is stiff enough to apply but not hard. Optionally decorate with walnuts and carrots. Use your favourite nuts, walnuts and pecans are generally the best. Try Pistachios if you like. with skin and not roasted or salted. Substitute 1 cup marzipan, cut in small pieces instead of pineapple if you wish. 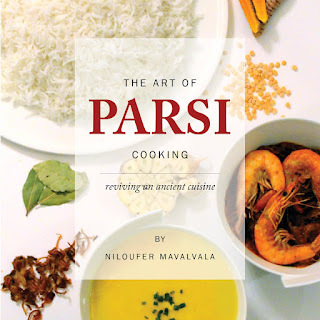 For recipes from my cookbook The Art of Parsi Cooking; reviving an ancient cuisine click the link. Yes I have made this cake several times. It will taste fine without the pineapple, but generally one should substitute something else when you remove anything from a recipe. Remember that cooking is an art, but baking is a science! Pineapple will give you the sweetness and the moisture that the recipe needs. I suggest you pick another juicy fruit if you prefer in the exact same weight.Good Luck!